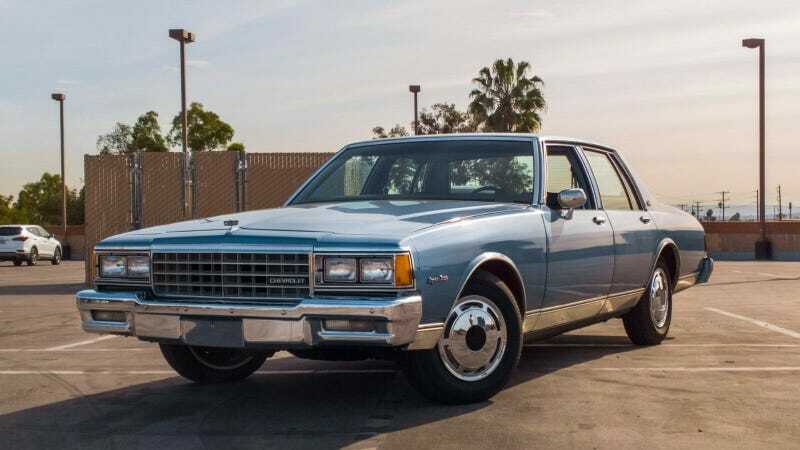 A Jalopnik reader turned up this for-sale listing of what appears to be the perfect 1980s Chevy Caprice. So how much is it worth? There are a couple different years of the full-size Chevrolet that you could argue are the very, very best. (The fishbowl coupes from the first downsized years of 1977-1979 are a personal favorite, as are the gruff 1965s and bubbly 1961s.) But it’s hard to argue that any of them offer a more stylish experience in the present day. And what is that experience? The 1980s Caprice represents courage in the face of adversity, or at least enough coke to cover it up. Under the skin this Box Chev is as normal as conceivably possible, with a small block and an automatic running power to the rear with body-on-frame construction. It is simple. It is tough. It is The Car. The car is for sale in LA showing a very tidy 66,000 miles, 600 away from being perfect. The roof has a chunk of missing paint but the AC, reportedly, blows cold. At the moment, bidding is at $8,000 and the buy-it-now is 10.5, which both seems like a lot for an ordinary car, but nowhere near enough for what is, in a way, a true classic. What&apos;s The Best Chevrolet Caprice? But What About A Five-Liter Caprice As A Snow Car?